Noor Inayat Khan, operating as a wireless operator, was also betrayed, in October 1943. Imprisoned and questioned by the Sicherheitsdienst (SD – the SS intelligence service) at its notorious Avenue Foch HQ, she escaped over the rooftops only to be re-captured during an air raid (the German routine was to head count all prisoners when the air raid alarm sounded, hence her absence was discovered). She gave nothing away during her interrogations. However, against all the security protocols of SOE (which, as MRD Foot has pointed out, were often ambiguously worded in the manuals), Noor had not destroyed her transmission notes or ciphers. The Germans were able to decode the messages and ‘turn’ her radio and, despite some suspicions at home, for several months the British believed Noor was still at large and transmitting. This led to agents beings sent to France with the SD waiting to receive them. The fact her radio was turned should not detract from Noor’s bravery, either before and after capture – at one point she had been given the chance to pull out, but elected to stay on as the last Paris-London link. Sadly, it was an all too common an occurrence, especially in Holland. There the Germans played the devastating Englandspiel (the English Game) with captured transmitters through most of 1942-3, arresting the agents SOE sent in, the majority of whom perished. After Avenue Foch, Noor endured months of solitary confinement in shackles in a German prison and was eventually murdered and her body burned at Dachau concentration camp in September 1944, along with fellow SOE recruits Yolande Beekman, Eliane Plewman and Madeleine Damerment (with a terrible irony, one of the agents lured to France by the SD using Noor’s radio). Noor was 30 years old. She was posthumously awarded the George Cross and the Croix de Guerre. 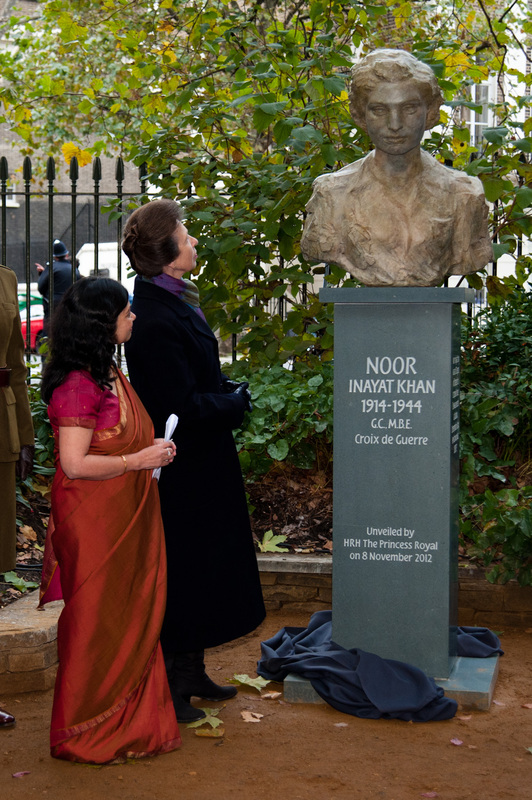 Her memorial, a bust sculpted by Karen Newman, is located in Gordon Square Gardens, near the University of London. Recommended books on SOE and the female agents include Sarah Helm’s A Life in Secrets (a fascinating biography of Vera Atkins, who was a lynchpin of SOE’s F – for France – Section), Flames in the Field by Rita Kramer, which traces the lives of the four girls murdered at Dachau and, the book that led directly to the memorial, The Spy Princess by Shrabani Basu. Thanks to Martyn Cox who has created an invaluable archive of interviews with SOE, FANY (First Aid Nursing Yeomanry), escape line and ‘special duty’ RAF squadron veterans. See www.our-secret-war.org. This entry was posted in Books on November 9, 2012 by Robert Ryan.